The Lair pictured to the left was not really a disappointment, just really difficult. All those poor quarters lost. Last week I was shown, by another kind Dwarf, the Lair in the Dwarven region of Ekrund. Lairs are non-instanced world bosses that usually require some sort of puzzle solving to reach. As we approached the the entrance, which was nicely done, I got a tome unlock. This unlock gave a nice background story of the Lair. The door itself was sealed shut with no clues as how to get it to open. I was eager to unlock the secrets of the lair, so I went to the story. It was good and seemed to provide some clues as to where to look next. I spent a couple hours searching the countryside for anything that could help me open that door. Sadly, I found nothing. Not a big deal, could just have missed it. *Note: It may be other lairs do actually use the story, I have only been to this one. 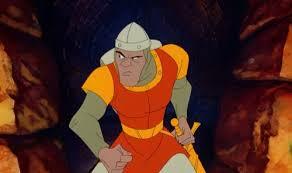 I loved the Dragon's Lair back yaer one and two! What a nice multiple choice adventure! I did badly at that game. My reaction time was always too slow.